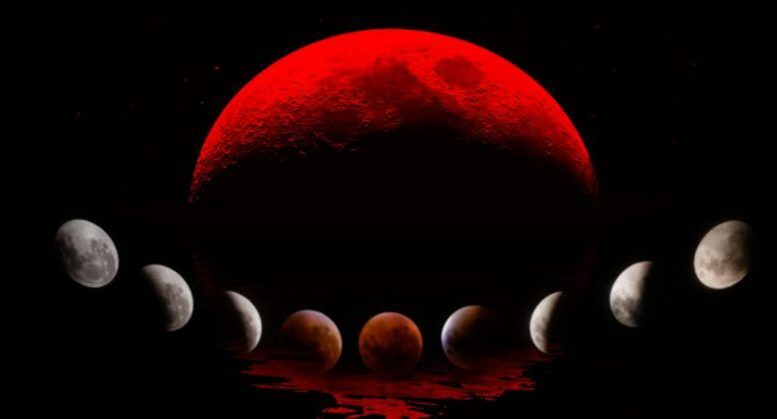 On January 31, around midnight, the full moon will not only be super, it will be a blue moon and a blood moon. The blue moon comes as it will be the second full moon in a month. That happens every two and a half years, hence the saying “once in a blue moon”. But wait, wait – these two celestial events, the blue moon and the super moon, will also coincide with a total lunar eclipse. And with Earth in between the Sun and the Moon, sunlight has to pass through the Earth’s atmosphere, which scatters the green to violet light more than it scatters the red light. So the Moon appears red – a blood moon. That’s three big Moon moments on one glorious night for skywatchers, and NASA is calling it the ‘Super Blue Blood Moon’. The last time all three events lined up this perfectly was more than 150 years ago. According to the Canon of Lunar Eclipses, the last time humans saw a total eclipse of a blue moon was 31 March 1866. The US will miss out on the full spectacle as the eclipse will happen too close to the Moon setting. You can see where the eclipse will be visible in the graphic below. The Northern hemisphere times can be found here. For Australia, the point of greatest eclipse occurs at around 23:30 AEDT. The totality will last around 1 hour and 16 minutes. 1 Comment on "Know about rare appearance of ‘super blue blood moon’ 2018"